One morning at 3:00am about two years ago I woke up on the couch with the TV on HGTV. 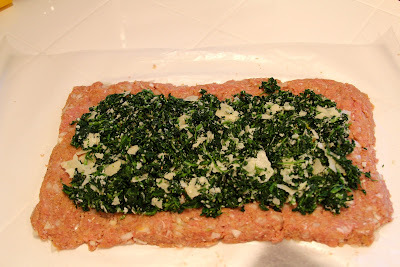 The show was just ending, but was doing a recap of the items that were being made and there was this turkey meat loaf with spinach that looked so tasty and as a bonus is pretty good for you too. After I got up the next morning (I turned off the TV and went to bed at 3:00am) I tried looking for the recipe online, but couldn't remember the show and couldn't find a recipe that was like what I had seen on TV. So I decided to experiment and make my own. The recipe has had some tweaks depending on who I am making it for, but this is the basic recipe that is easy to make and reheats well for lunches. You can use any ground meat, but to keep it on the lighter side I used turkey. You can add different spices or condiments to suit your taste, but this is pretty tasty on it's own! 2. 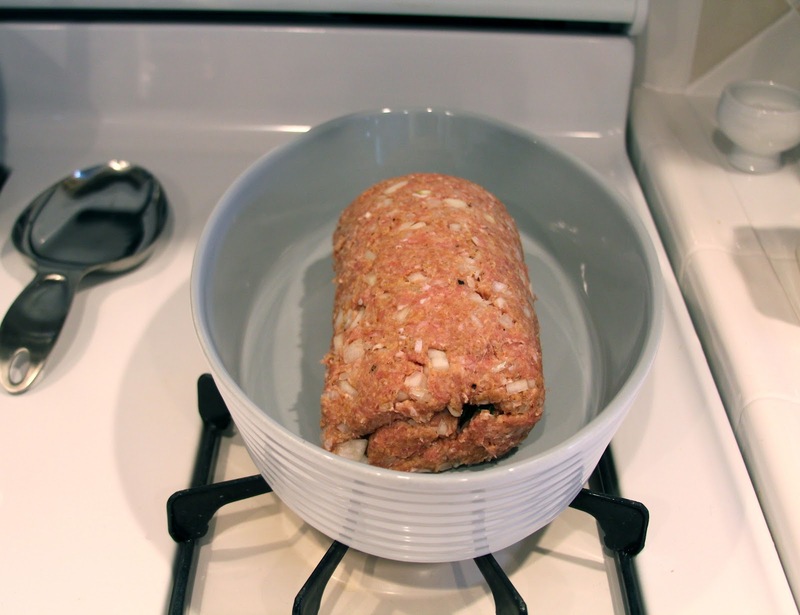 In large bowl, combine meatloaf ingredients, mixing lightly, but thoroughly. 3. 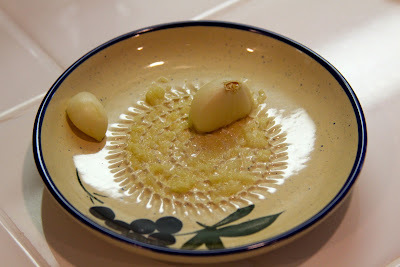 In medium bowl, combine filling ingredients; mix well. Set aside. 4. Place meatloaf mixture on waxed paper and pat into a rectangle. Spread filling over meat leaving 3/4 inch border about edges. 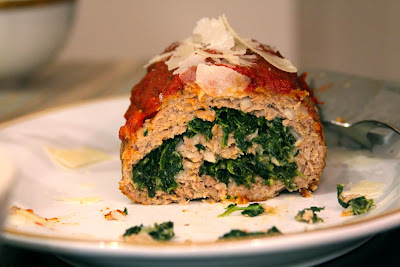 Starting at one end, roll up jellyroll fashion, pressing meat mixture over spinach filling at both ends to seal. Place seam side down in pan. 5. Bake in oven 1 hour. 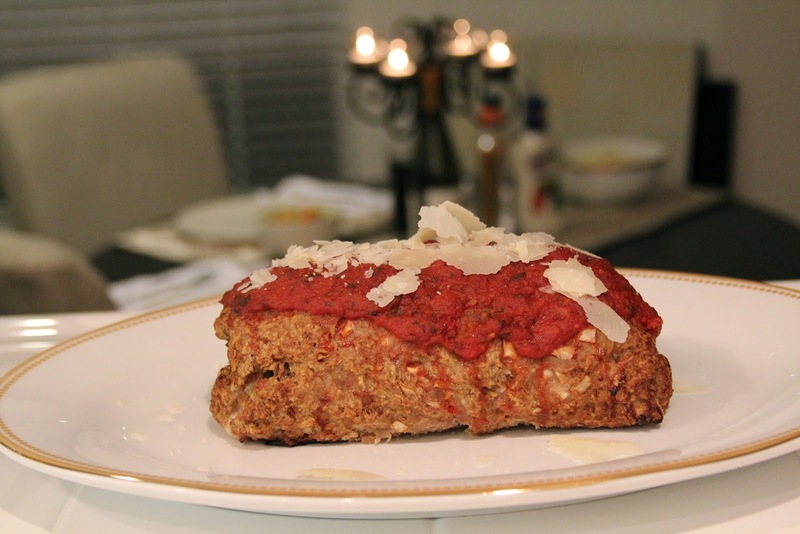 Spread marinara sauce over loaf and continue baking for 15- 20 minutes or until meat is cooked through. Sprinkle with Parmesan. To serve, cut into 1 inch thick slices and top with extra marinara sauce.